Over the years, you probably accumulated items that became unnecessary or obsolete. Before you move, these items should be removed from your current residence. This not only saves you in moving costs but makes your new home feel nice and fresh. Removing clutter has the potential of becoming a larger project than the actual move. It’s not until you start opening those storage areas that you’ll realize how much you’re hoarding. If you’re unsure on where to start or where to go, keep on reading! 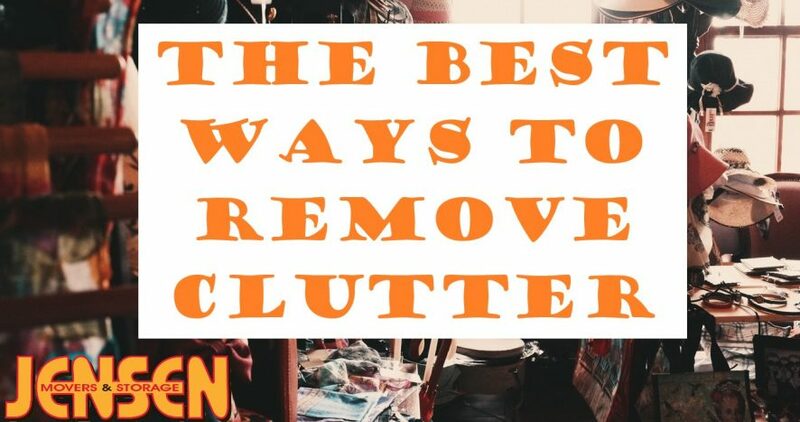 You’re going to learn the best methods to remove that unwanted clutter from your house. As much as you’d like to start throwing things away, make sure to organize and tidy up. You’ll want everything to be where it’s supposed to be. Starting with a clean, organized space will prevent you from getting sidetracked and help you sort properly. This task will also help in the future for when you start packing. No one wants their candle set mixed with the bathroom scrubber. The best way to start your decluttering is to focus on one room at a time. If you start pulling things out with no direction, you’ll end up with a bigger mess than before. Experiment on a smaller room, like a closet or bathroom. This will get you moving and figure out the best system for your large spaces. Sorting is, surprisingly, the easy part. Everything inside your home are either going to the new place or not. Continue this mindset as you separate and stay firm. Don’t create a “I’ll think about it” pile. Once you determine the items you’d rather part with, you’ll need to figure out how to get rid of them. The common forms of purging are gifting, selling, donating, or disposing. Disposal is your easiest option for your unwanted items. Start disposing early so your trash collections are evenly spread out. Dumpster rentals are also available for bigger or last-minute projects. Remember to break down larger pieces and research hazardous waste that the garbage company won’t accept. If you’re running out of time, talk to your moving company. Professional movers offer disposal services at an extra cost and, sometimes, the same day as your move. Talk about convenient! You’ll find this could happen to you if you can’t sell furniture in time. Who doesn’t love extra $$$ in their wallet? Old décor, electronics, furniture, collections and antiques are all items you can try to sell. The downside is that this can take up a lot of your time. We recommend starting with a garage sale. Use social media, directional signs on main roads and word of mouth. Also, get ready for some hagglers! Once you’ve narrowed down your clutter, you can try online listings. Proceed with caution as scams are not unheard of. For smaller items like jewelry and collectibles, use auction sites like Ebay. This will help you reach a specific demographic. If you’re selling a high-value item, make sure it’s appraised. Consider researching and giving gently used items to charity. Your donation could have a lasting impact on a family in need. If you’re short on time, search for a group which offers free pickup. Make sure to save all donation receipts for tax season. The Spruce has a great article on where you can donate everything in your home! You won’t have to look too far to find somebody that’ll take something for free. Reach out to your family members, friends and co-workers to see if they’re interested in taking anything. To get rid of everything at once, throw a moving party and have a freebie area. Spice it up with a party game where, whoever wins, get the first pick of the pile. Don’t feel bad about re-gifting when the holidays come around. Just make sure you’re not giving the present back to its original gifter – whoops! Jumpstart your moving preparations in a clean and organized home. You’ll be ready to go before you know it! Do you need a moving estimate? Here's everything you'll need to know. Check out our 20 packing & moving tips!